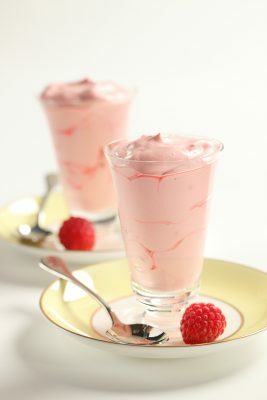 Because frozen raspberries are easy to find this pudding can be made all year round and can be a little taste of summer on a cold February day! Only use fresh raspberries when they are in season and plentiful. Because raspberries vary in sweetness always check the sweetness of the finished fool. It may seem counter intuitive to add lemon juice but this brings out the intensity and flavour of the raspberries so taste and add extra sugar as needed. If you want to reduce some of the fat content you could substitute 100mls of cream with Greek yoghurt but it is likely to make a slightly runnier fool. Serve with some crisp shortbread or an almond biscuit served on the side. Put the raspberries in a saucepan with the lemon juice and icing sugar. Crush with a spoon and bring slowly up to the boil. Once it has reached simmering point turn off the heat and push the raspberries and juice through a sieve. Discard the seeds left in the sieve. Allow the puree to cool.